1991's Street Fighter II is a game that got people very excited and led to a surge of interest in the fighting genre. It's also a game that got updated a lot — new moves, new characters, new speeds... — while being ported to numerous home consoles and computers. 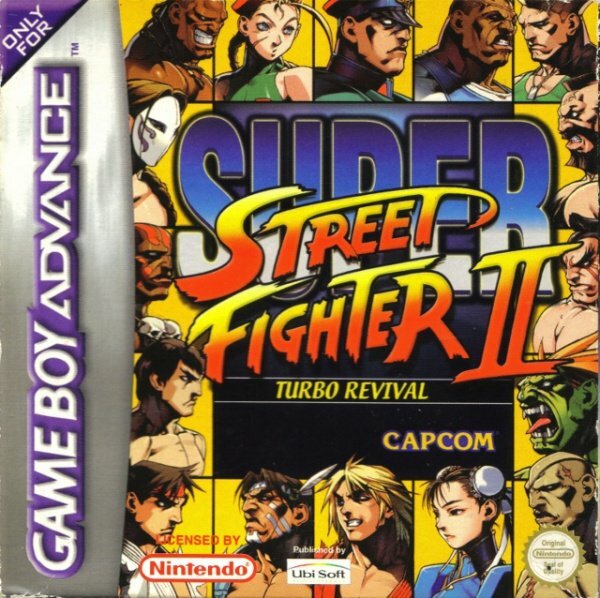 Several of those ports have seen a Virtual Console release already, and now the latest addition to the eShop is Super Street Fighter II Turbo Revival, which originally appeared on the Game Boy Advance during the tenth anniversary year. You begin the game able to choose from sixteen fighters: the original eight World Warriors, the four bosses and the four "New Challengers". There's a variety of fighting styles and special moves offered by the characters to keep the brawling interesting. From the agility of Vega and Chun-Li to the slower-but-powerful likes of Zangief and T. Hawk, or someone different such as stretchy-limbed Dhalsim — there's a lot to experiment with. 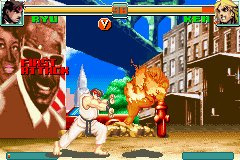 The "old" versions of the characters that were previously available in Super Street Fighter II Turbo are not included but you can unlock two versions of Akuma – the second allowing you to hurl two air fireballs instead of just the one. The main mode of play is — of course — Arcade, where you pick your character then fight against ten others. If you're worried you'll get bored of smashing people's faces in, the bonus stages are back to put your mind at rest, allowing you to take out your anger first on a car and then later some falling barrels. 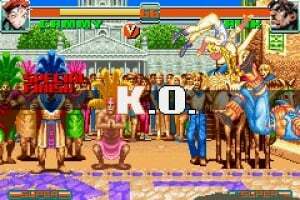 It's a lot like all the other SF2's available but now with the addition of the Super Combo meter that climbs up as you fight, allowing you to unleash a devastating combo move once it is full. For some variety the more you play, the more things you unlock including different game modes and the two Akumas. The other game modes fall into two categories: "Survival" and "Time Attack", providing a variety of challenges such as seeing how quickly you can clear the bonus stages (including a second barrel stage) or defeat a certain number of opponents. The controls work well, responding to your input nicely but, unfortunately choosing the strength of your attack is not straightforward; whilst the Wii U has plenty of buttons the GBA did not. With three strengths of punches and kicks and the handheld only having four buttons a workaround had to be found. Your first option is having two attacks on one button, holding the button longer to determine the strength. It does work but anything other than a very quick tap performs the "long" attack so it's not ideal. The second option is a method that would later be used in the GBA port of Street Fighter Alpha 3, although it works better there than it does here. To perform the third strength of attack you simply push the other two together. If you keep one of the buttons held down, tapping the other will perform the attack again, although (unlike Alpha 3) this doesn't always work. Buttons can be re-mapped in the Virtual Console menu, but it's unfortunate you can't map multiple GBA buttons to a single Wii U one to re-create the traditional six-button setup. 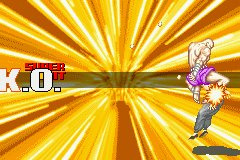 If you are having trouble performing the special moves, the game features something called Easy Commands. Toggled on or off by pressing Select during the game, these allow you to perform special moves with simpler button presses such as forward + punch for a fireball and removing the need to charge for other moves. Super combos are also simplified with all bar Vega's being performed by simply pushing A and B together. The Arcade mode provides plenty of enjoyment with four speed settings to choose from depending on your preference. Whilst it's not as tough as some versions of the game, it can still provide some challenge when played on the higher difficulty settings (eight to choose from). Despite a low resolution and some animation trims, the game still managed to look the part on the GBA thanks to the small screen making these flaws less noticeable. Though it still looks alright on the Wii U GamePad, television play is less impressive (although turning the screen smoothing option on in the Virtual Console settings improves things a little). 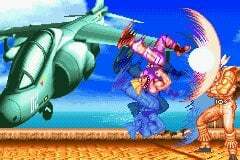 There are also occasional moments of slowdown but generally the fighters leap around the screen fluidly. Resolution aside, some areas of the visuals had actually had an upgrade: new and gorgeous artwork is used throughout including for the versus screen and post-fight, showing the victor in a dynamic pose. One gripe is that irrespective of the colour outfit you chose (nine available), the characters are shown with their default palette in the artwork. Characters only have one win quote and in some instances not the correct one. As most people know three of the bosses had their names switched around outside of Japan, and whilst that has again happened here, evidently someone got confused as M. Bison has the claw-wielding Spaniard's win quote, who in turn has the boxer's victory line, while NotTyson quotes the Shadaloo Dictator. It's easy to see how the error could have been made but it's surprising that no one noticed it before approving the game's release. The sound effects add a lot to the game with many thumps, crashes and the usual calls of "Hadouken", "Tiger" and "Sonic Boom", and the music also works well. 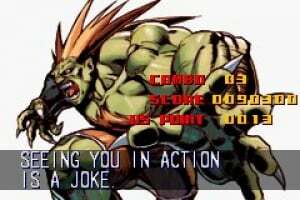 Complementing the on-screen action there's quite a variety of tracks here, such as the jungle theme of Blanka's stage, the flair of Vega's or the industrial sounding track on Zangief's stage. Compared to some releases there's not quite the same range of sounds used and it certainly can't compete with the wonderful arranged soundtracks that have featured in CD-based ports, but the quality of the original compositions shine through and greatly enhance the experience. As you play through the game some more visual changes become apparent. One minor visual improvement that features during fights is the flame effect. Previously characters (of varying sizes) hit with a flame attack shared an engulfed sprite but they now glow orange whilst smaller flames burn on them – less painful looking maybe, but also less daft. More noticeable are the new stage backgrounds. 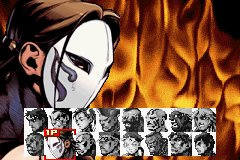 Some remain the same but there are also eight new ones, although a few have appeared in (or closely resemble) other Street Fighter games. Some aren't as interesting to look at (Bison appears to be fighting in a storage room) but generally they work well with the best being the rooftop battle of Ryu's stage – or perhaps the very similar Akuma one with its red-orange sky. As with all GBA titles on the Virtual Console, multiplayer is not available. On the original release it was fairly basic (pick your characters, set handicap, fight!) 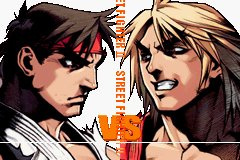 but Street Fighter II versus another player is a two-player experience that is tough to beat, and so its omission is disappointing. In better news this Wii U version improves on the original GBA release by fixing a bug relating to Akuma. Should you meet certain conditions during your playthrough of the Arcade mode you will face Akuma instead of Bison for your final fight. Whilst this worked just fine in the Japanese version of the game, something went horribly, horribly wrong in the Western release causing the game to crash and also mess up your times on the Survival and Time Attack modes. Luckily it has now been fixed and should you do well enough you can now now take on the master of fisticuffs. Trying to beat your various times in the Survival and Time Attack modes adds a replayability, and you can of course now post your best times to Miiverse if you'd like to see how you compare to other players. The Akuma bug being fixed is good, but the bad (if completely predictable) news is the lack of multiplayer. The characters, moves and music that made Street Fighter II great are all here and you can certainly have fun with this particular version. Of course much of what appeals with this game is available in the other versions of Street Fighter II and as well as multiplayer they have less awkward controls. The new artwork and stages (even if there wasn't anything wrong with the old ones) generally work well, but unless you have a strong desire to experience Super Combos and Akuma on your Wii U it's hard to recommend this over the other versions available on the eShop. No. I get why 2 is on eshop. But you know what we really need. Might consider getting this if/when it comes to the US. I played the GBA version to death. I remember how amazing it was to have a full Street Fighter 2 experience on a handheld when this came out. This and Street Fighter Alpha 3 were highly praised at the time. I have Street Fighter II: Turbo on my Virtual Console, so no thank you. This game is.... good, it´s decent at best, but the snes/genesis versions are far superior in almost all aspects. They should instead make street fighter alpha 3 upper for gba available on the wii u eshop, that´s a way better game, it´s much more polished in my opinion and resembles far better the original source material. I played a lot of "Street Fighter Alpha 3" on the PS1. I had totally forgotten it had come out on the GBA as well! Was it as good as the PS1 version? If yes, I would definitely purchase it on the Virtual Console! @KO-Cub 3rd Strike would be amazing, while they are there Darkstalkers resurrection too! Please Capcom, pretty pretty Please! @KO-Cub 3rd strike would be awesome, already have it on PS3 though. I'd bite...but then I remember that I have Super Street Fighter II HD Remix on PSN. the bad (if completely predictable) news is the lack of multiplayer. I don;'t think any game on Virtual Console should be marked down for lack of multiplayer. Thats a fault of Nintendo, not the game or its developer. I played a lot of "Street Fighter Alpha 3" on the PS1. I had totally forgotten it had come out on the GBA as well! Was it as good as the PS1 version? Nope. It really wasn't. SSFIIT Revival is a better port than GBA Alpha 3. They should instead make street fighter alpha 3 upper for gba available on the wii u eshop, that´s a way better game, it´s much more polished in my opinion and resembles far better the original source material. Its really not. The sprites and backgrounds are very small and under-detailed. Even in comparison to SSFIIT Revival. ]I have Street Fighter II: Turbo on my Virtual Console, so no thank you. Its not really the same though is it? @MikeW Yes but the music are a bit compressed, some backgrounds were dropped, the announcer is gone and you need to press two buttons to get the mid attacks. It's still offer a lot of fun to play but doesn't had much to offer in terms of replay value outside of multiplayer. The story mode and dialogues are gone and without World Tour Mode the game is just too barebone but for a portable fighting game of its time, it's still one of the best. You got all the 38 characters, a few additional modes, some great multiplayer options, all the -ism and unlockable goodies from World Tour Mode as well 3 style of play - Classic (SFII style, no super, no ism), Saikyo (underpower, your moves take less damage than CPU), and Mazi (handicap style, you are require to win two rounds but lose one and you're out). @KO-Cub seconded. I have it on 360 but I would double dip sooooo fast. That lousy bug was Ubisoft's fault as they handled the US and EU english releases and they're both blown. I think the internet for being as good as it was when this tidbit popped up when the game was brand new as I almost ended up buying it. I along with Final Fight One (thanks to the mutilation censorship it got) bought the pair as imports instead from Japan and never regretted it once bit. SSF2 was sloppy, but the FFO chop job (girls removed, blood removed, oh my god to the car removed') was just 1991 SNES FF childish. That's the wrong platform but they refuse to admit it. This is my favorite version of Street Fighter II. The speed is perfect, the backgrounds are cool, and I love the game modes. Well the 3DS isn't getting any new VC games from anybody right now. I think Nintendo has banned every other company from submitting their VC games for release on 3DS. Love this port, and alpha 3 as well. This is a great game. You can do super combos and play with Akuma. I was waiting for this. But.. no 2 player mode? REALLY? @tobbonni Darkstalkers resurrection would be amazing!!! I really love darkstalkers.